With the victory of the Bush surge, several projects are now being completed for the Iraqis. 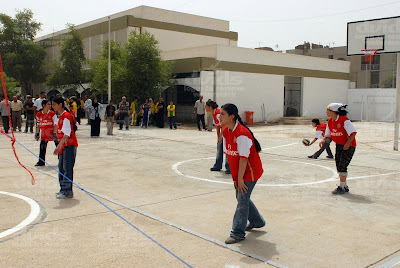 The high school girls in Rashid will have new sports facilities this school year. 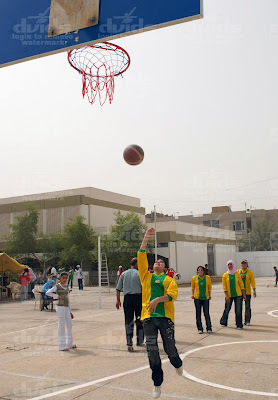 An all-girls high school celebrated the opening of several sports facilities and a new generator July 16 during a ribbon-cutting ceremony in the Rashid district of southern Baghdad. The renovation effort stemmed from a partnership with the Rashid District Council, the Ministry of Education and Coalition forces. Capt. Thao Reed, a 1st Brigade Combat Team, 4th Infantry Division company commander encouraged the Karkh II Sports Director of the Education District, Ahmed Abdullah, to establish a girls’ sports program across Rashid, and advised the school board to renovate the school. The ceremony showcased a new indoor volleyball court, outdoor basketball and volleyball court, and a generator to provide electricity.